CTR or click through rate is the relationship between impressions and clicks. Out of the number of times your ad or search result is shown to a visitor, how often users click it and not ignore it. This metric is among some of the most important benchmarks of your toolset for online marketing. It is vital for you to understand its importance in terms of online success. In a nutshell, click through rate is the number of times an ad is clicked divided by the number of times the page or ad unit is viewed. In other words, it is the ratio between number of page views and number of click on the advertisement. For instance, if you have an advertisement running on your website/blog and it is viewed by 100 people. If 5 of them click on the ad, your CTR would be 5 percent. On a PPC Model, the higher the CTR percentage is, the better earnings your site will generate for you. Therefore, it is important to place the ad in such a way they are viewable and at the same time not obtrusive. Striking a balance here is important to generate ad earnings over a longer term. You must be wondering what a good CTR is. I’ve seen websites performing from anywhere between .05% to whopping 10%. It primarily depends how much time you are spending to optimize your website for more clicks and what niche the website is about. More about this later, but you should also know that the average CTR for the display advertising industry is about .10%. Then you also have many publishers out there who are getting considerable clicks on their Adsense Ads but their revenue is pretty low. Let us cut out the myth once and for all. Getting a huge number of clicks on Adsense advertisements will not guarantee good income. There are a number of other factors involved. For one thing, you need to targets the ads that can give you good PPC. Sometimes a single click earns you more than 100 clicks. It all boils down to the eCPM or actual earnings. There are ways using which you can measure the eCPM for ad units/types and optimize it. What is a good Adsense CTR? 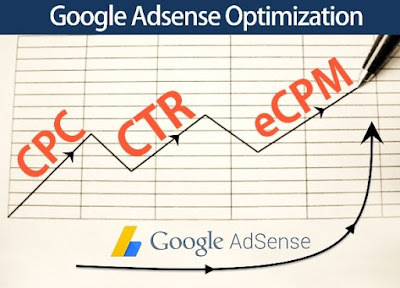 It is strange how everyone is looking for a satisfactory answer to one question: what is a good click through rate for Adsense? Let us attempt an answer. It is necessary for you to understand that it is against Adsense TOS to reveal exact statistics about your account and of course, the CTR. Therefore, it would not be possible to pepper up the article with real life examples. While some blogs do everything to increase their click-through-rate and fail to increase it more than 1 percent, others do get close to the double figures. Majority of the bloggers have CTR between .50-to-3-percent-range. At this rate, not only blog or website earn a decent amount, but it also stays pretty safe. One the other hand, if your ad units get too many clicks and high CTR, your Adsense account will be exposed to certain risks. You must be wondering if you can compare your CTR with other blogs. Unless you know the blogger personally, there is no bench marking tool to that for you. Even the Adsense Scorecard, which google calls a bench marking tool, does not really compare you with our peers in terms of CTR. Why is it difficult to compare CTR? Comparing CTR, and a number of other Adsense statistics, is difficult because every website/blog is incredibly different. Comparison might even be pointless at times. Surprisingly, CTR varies tremendously from one blog/website to another, even if your blogs have every other factor controlled. The simplest reason that comes to mind is the topic of the blog. For instance, many publishers believe that websites with products related topics appear to get higher click-through-rate than other sites. Their argument is pretty valid. According to them, people tend to click on ads more when they are in buying mode. When they see an ad that meets their requirements or is about the relevant product, they are much more likely to click on the advertisement. Even if they don’t want to buy that product, visitors feel good to explore and find more details about it, which will help them make a decision in the future. CTR as well as CPC can, in fact, vary seasonally. The Adsense team mentions about this on its support page. For instance, there are countless blogs out there who claim to have higher CTR on weekends. While some have pretty low impressions throughout holidays, some feel that the holiday season, can generate huge variations in CTR. Of course, these variations vary from website to website, considerably depending upon the visitor demographics. Let take this one with an example. Let’s say you’ve got a blog about ballpoint pens. Which ads do you thinks have more probability of being clicked – ballpoint pen ads or dog food ads? Of course, your visitors are interested in ballpoints and they will click on ads relevant to what you are talking about on your blog. In almost all cases, the more relevant the advertisements are to the subject/niche of your blog, the more likely they are to get clicked. While there could be few blogs with topics that are difficult for Google to distinguish, but generally Adsense is quite good at this. They have ads for almost all verticals and niches. There have also been a few cases where bloggers have contacted Google about irrelevant ads, and Google has made changes to fix the problem. In order to optimize your CTR further, you can also block advertisers which are irrelevant to your domain, if you see their ads/creatives appearing regularly on your ad units. It has been repeatedly reported that websites and blogs with higher level of repeat (loyal) readers have lower click-through-rate as compared to the ones that have high search engine traffic. The only logical reason to this problem is that your loyal readers become blind to not only your website design, but also the ad positioning, which is why Continuous Ad optimization is needed for a website to maintain a higher CTR. Repeat visitors mainly look at the content, you share with them, so mixing ads in the content, makes sense too. Search-Engine visitors, on the other hand, are mostly looking for specific information. They normally take action, which puts them in an information gathering mode. As a result, they are more likely to click the ads on your website or blog. Another group of readers is the one that is referred to your website or blog by another website. Such readers can choose any course of action, depending entirely on what the referrer is all about. However, most of the times, CTR is low for such readers. Therefore, do not expect too much from refered traffic. What’s around the Ad unit? There are many design factors that can affect the CTR. You need to be very careful here though. You should not, in any case, draw extra attention on the ads by creating animated graphics or putting them inside a obtrusively colored box. This will only lead to an account ban. However, there are many Adsense publishers out there who have developed some subtle, clever ways to draw the attention of their readers towards the ads. One important technique that does not break any Adsense TOS is to utilize the areas around your advertisements to your advantage. However, Stats have shown that advertisements perform far better on a clear, white background and white space around them. Why don’t you test between different designs, and see what happens? An important factor for click-through-rate is the design and positioning of the advertisements on your blog or website. For instance, if you put the ads on the very bottom of the page, there is a chance that very few people will see them, which will definitely result in very low CTR. You don’t want that, do you? Therefore, you should always position the ads where they can be seen and clicked easily. The same is the case with the colors you choose for the ads. Select the right colors and you are definitely going to improve your CTR. Place ads above the fold. Merging them with the content. Using Wider, instead of longer Ad units. Using either a similar or contrasting color theme [Test what works best]. Does your blog contain any outbound links other than the Adsense ads? If your answer is NO, there are more chances of your visitors to click on those particular links. There are countless bloggers out there who are using this technique to increase their revenue. All they do is drive traffic to their website through useful, high-quality content and do not have any other outbound links. Their click-through-rate is normally higher than the pages with outbound links. Of course there are a few problems with this technique, since you would not be able to interlink your blog. This will not only make your site insular, but also makes search engine optimization difficult. De-clutter your blog for better results! Click-through-rate is the most important and heavily weighed part of quality score. What is the first thing Google looks to when trying to get the feedback of users on advertising text? Of course, CTR! If a particular ad has a higher click-through-rate, it means that majority of the users find it useful and relevant to what they are searching. Relevancy is the second most important component. Google considers the relevancy of your keyword to an advertisement. Similarly, google uses CTR to understand the relevancy of an advertisement to your website and maintains a quality profile for your website. Sites with very low CTR, could be considered poor in terms of quality (exceptions being there) while the sites with very high CTR, are suspected for activities against google’s policies and have to go through automated and manual reviews. Content is the king. You must have read this statement a hundred times, and it is absolutely true. High-quality content is something that makes your visitor stay on your site and click on the ads. Besides, making a couple of changes to your ads’ placement and types can also boost your click-through-rate. Outlined below are some tricks you should follow to get your desired results. This is the most important tip anyone can give you increasing your click-through-rate. Great content brings more visitors, resulting in more revenue. Rather than creating countless useless sites made just for making some quick bucks, take some time out and build impressive content for your blog. Writing high-quality content is undoubtedly the way to go. It will not only help with your click-through-rate, but will also allow you to leverage on premium SEO. Moreover, it will allow Google to place targeted ads on your blog for your audience. Having more relevant ads is the only way to lure your visitors to click them and boost your overall earning. You need to test different placements, positions and combinations for advertisements on your blog. Avoid putting ads on random positions, since it will have a negative impact on CTR and your earnings. What you should be doing is trying out different colors, types and sizes of ads in order to see what works best for your website. Moreover, you need to keep switching the ad positions. This technique works pretty well with your regular visitors. Since your loyal readers visit your blog regularly, they start ignoring the ads if they are placed on the same position all the time. This is known as the “banner blindness”. Periodic change in the placement of ads is the only way to cope with this problem. Do you get frequent suggestion from Google? Majority of bloggers just ignore these emails from Adsense. You should not. Read what they have to say and then test if its correct. Always try new things. Try Modifying the advertisement colors to more bright versions rather than standard adsense colors. Majority of the Adsense enabled blogs or websites utilize the standard colors and visitors get used to it. Changing the colors frequently to brighter shades allow the ads to stand out from the rest of your blog’s content. It will definitely grab the attention of your visitors. Also, you need to make the font of your ads bigger than the content font. This will allow the user to see the ad immediately. It will make the ads prominent, increasing the chances of clicks. Do you have a lot of posts or pages? Just remove all those ads from the places that do not convert (use heatmaps!) and have very low CTR. De-clutter your blog. After doing this you’ll see that clicks are no more wasted through unwanted, crappy posts.